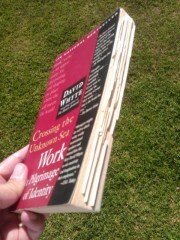 Yes, those are post-it notes you see crowding the edge of my copy of Crossing the Unknown Sea: Work as a Pilgrimage of Identity by David Whyte. From the looks of it you might think I marked every single page. You wouldn’t be much mistaken. I devoured this book. 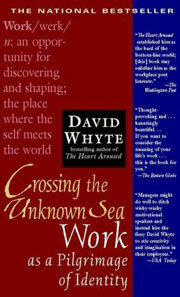 This book is about the process of finding work that adequately, fittingly, and meaningfully integrates with one’s own life development jouney. As suggested by the title, this book is for the pilgrim… the person on a journey of self-discovery and professional expression. You can probably tell from the quotes that this is not a book of formulas, tests, assessments, or answers. My list of pull quotes most likely seems to you either attractive and intriguing or off-putting and irrelevant. This book is for those of you who see yourselves on an inner journey in search of a professional form. Click here for a link to get a copy. This entry was posted on Wednesday, July 4th, 2012 at 10:01 am	and is filed under Karl's Library. You can follow any responses to this entry through the RSS 2.0 feed. You can leave a response, or trackback from your own site.